There are many new developments in the world of regenerative Orthopaedic medicine. One innovative treatment option is called Neural Prolotherapy. Traditional Prolotherapy has focused on ligament-tendon healing, and has shown to be a powerful treatment modality. 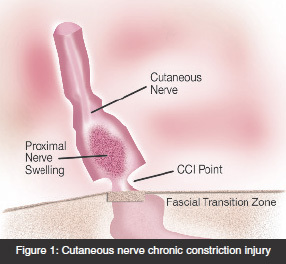 With Neural Prolotherapy, however, we shift our focus to the subcutaneous nerves as a source of pathology. These subcutaneous nerves in a pathologic state can lead to neurologic inflammation and pain. We introduce and explore the use of low dose dextrose Prolotherapy in the treatment of neurogenic inflammatory pain. Neural Prolotherapy is indeed a fantastic treatment option that has the potential to further our healing profession. Prolotherapy or Proliferation Therapy stimulates regeneration and repair of injured tissue with the use of dextrose and other agents. Neural Prolotherapy, also called Neurofascial Prolotherapy (NPT), is one of the newest advances in Regenerative Orthopaedic Medicine. Neural Prolotherapy is not to be confused with traditional “German” Neural injection therapy. German Neural Therapy is a great treatment option using procaine to treat interference fields and scars. I regularly treat my patients with scars using this German Neural Therapy technique. Neural Prolotherapy (NPT) was primarily born out of a clinical observations and involves the treatment of neurogenic inflammation. Neural Prolotherapy has its research roots dating back to a 1989 book titled;Intraneural Injections for Rheumatoid Arthritis and Osteoarthritis. The book was authored by Dr. Paul Pybus and Dr. Roger Wyburn-Mason. In the book Dr. Pybus explains the concept of neurogenic inflammation as it relates to osteoarthritis. Clinical observation has shown that a 5% dextrose solution with sterile water will give immediate analgesia (pain relief). In my experience, pain control will last from 4 hours to 3 weeks. Again, the proposed mechanism is a dextrose medicated inhibition of the neurologic inflammation. Dr. Lyftogt’s early research focused on the treatment of Achilles tendons. He has treated over 300 Achilles tendons with a success rate of more than 90%. Dr. Lyftgot has published six level 4 studies in the Australian Journal of Musculoskeletal Medicine since 2005. He has studied the shoulder, ankle, elbow, and hip. His 2 year follow-up shows an 80–100% success rate. Most patients need from 6–8 treatments for a successful outcome. I was extremely fortunate to study with Dr. John Lyftgot from in July 2012 in Oswego, Illinois. As in all forms of medicine, the closer we are to establishing the etiology of disease, the better the outcomes of treatments. When we consider the complexity of musculoskeletal derived pain, we need to address the etiology of pain at its root cause. There are many pain generators such as bone, ligament, tendon, fascial, muscle and nerve. Traditional Prolotherapy and Platelet Rich Plasma have demonstrated their structural healing ability. Now with the use of Neural Prolotherapy, we can address the pathology of neurogenic inflammation, bringing yet another level to our healing profession.